Download free Business notes manager tool online to create database file to store all notes lists. Files info management program provides restore option to revive and retrieve contents by searching undamaged note or database backup copies on hard drive of computer system. ...... Information tracker program provides easy switching between different categories to group and classify notes. 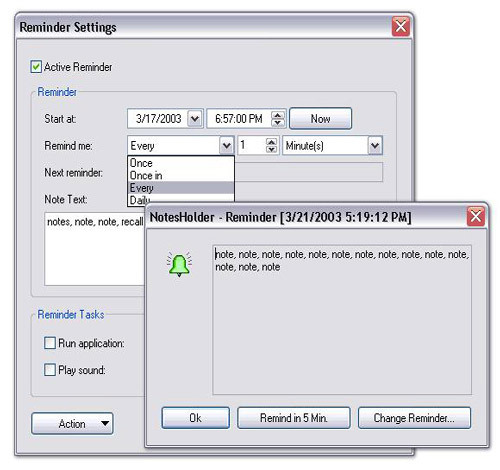 Notes tracking application facilitate user to set reminder triggering for unlimited number of times. Note tracker utility provides an opportunity to export all notes to XML or text file by specifying destination file and type. Information organizer enable user to automatically hide software window when switching to other application window. Qweas is providing links to Advance Notes Management Software 1.52 as a courtesy, and makes no representations regarding Advance Notes Management Software or any other applications or any information related thereto. Any questions, complaints or claims regarding this application Advance Notes Management Software 1.52 must be directed to the appropriate software vendor. You may click the publisher link of Advance Notes Management Software on the top of this page to get more details about the vendor.